I do my best to be considerate of others and treat them the way I would like to be treated but when it comes right down to it, I still have a tendency to put myself first. It must be hereditary. My grandson is only 17 months old and he did not need to learn to think only of himself; it comes naturally. 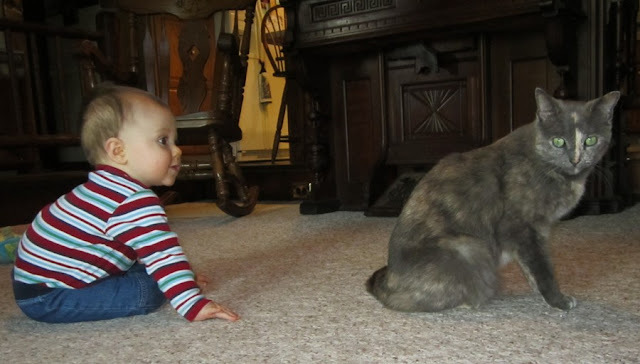 Rather, he had to learn how to be nice to the kitty rather than doing as he pleased, grabbing ears or pulling fur (lessons that came in handy when his little brother came along.) He already knows how to be selfish, but he will need to be taught how to share. This elevation of self is inherent. As much as we care for others, our default is still to look out for "number one." That's one of the reasons why the passenger seat in a vehicle is considered the "death seat." No matter how much we love the person sitting next to us, when we're driving and threatened with a collision our natural instinct is to protect ourselves. In doing so we put our passenger in harms way. Nope. The only good in me comes from Jesus. Any and every bit of putting others before myself does not come from me; it comes from Jesus and flows through me. 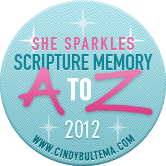 This is our next verse in the "She Sparkles" A to Z Scripture Memory Challenge. I have been so blessed by learning these verses; I want you to be blessed too! You can jump in anywhere at any time. Here are the verses we've learned so far. Won't you join us? 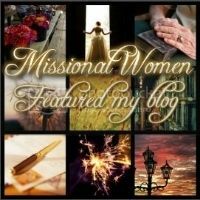 Learning to set self aside to serve others--only in Him and through Him. Good ones, Lisa. Thanks. 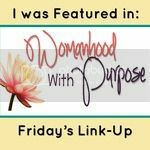 When I wrote children's books and inspirational romance novels, Romans 8:28 kept at least 3 books on track! What keeps me on track, though, is I John 4:18, "Perfect love cast out all fear." I had never thought of that passenger seat thing until I had kids. Especially when we had the second baby and had to decide which child would be behind the driver's seat and which behind the passenger seat. I felt like there was no way to choose, because my instinct was that one was safer than the other and how could I choose between my cildren who would get the safer seat? You're exactly right. Even our ability to love others comes from him. Love that little guy's face. So adorable! It really is a lifetime of putting down self, isn't it? And just when we think we have a handle on things, God gently points out something else. So true, and Thanks for linking it up to Matrimonial Mondays. While not exactly a marriage post, I will be featuring it next Monday because it is so applicable to our marriages.